Most high performance Cross Cut ( Level 3 and 4 ) and High Security Cross Cut ( Level 6 ) Paper Shredders are manufactured with high precision. The majority of these systems are built in Germany where high quality tempered steel is used in the process. Keeping the cutting heads well lubricated increases the overall efficiency and effectiveness of the shredder. Well lubricated cutting heads help prevent paper jams, keep the cutting heads cool and increase the overall productivity of the system. Cutting heads can be oiled manually by simply squirting oil onto the cutting heads. While this is an effective method, it is sometimes messy and difficult to determine when to perform this function. In order to eliminate the guess work and to make it easy for the operator to oil the cutting heads, Security Engineered Machinery invented the “automatic oiler”. The original auto oiler ( LK Series) included a one gallon bottle of oil connected to a pump that hung from the side of the machine. The device was electrically connected to the machine and would automatically draw oil from the bottle and distribute it over the cutting head. Over the years, SEM has made significant improvements to auto oilers. Today, SEM auto oilers are built-in to the machine. A small bracket holds a gallon jug of specially blended high viscosity lubricating oil on the side of the machine. When the system senses a need for oil, the machine automatically draws the oil. The see-through clear plastic jug and built-in LED indicators on the machine warn the operator when oil is low and requires a change. Many competitive oilers include a “reservoir” that requires the operator to “pour” the oil into the reservoir. In fact, many suppliers provide a funnel to help with this function. The primary complaint with this method is the difficulty of holding the funnel in place while pouring the oil. Another complaint is the misplacement of the funnel and the need to pour the oil into a small opening atop of the reservoir. This usually results in oil spills alongside the machine. As the inventor of automatic oilers and the ever ending desire to make improvements to the system, SEM has created a system with the operator in mind. The gallon jug itself acts as the reservoir. The containers are simply switched using a “quick disconnect” that snaps into place. No pouring is needed to fill messy oil reservoirs. The oiler bracket that holds the gallon jug can be placed on either side of the machine or in the back of the machine to accommodate the environment. In the end, simple to install and equally more simple to change the oil helping to prevent possible messy oil spills. Oiling of paper shredders are recommended to help maintain and increase the overall effectiveness of the system. Auto oilers that are easily installed and changed like those offered by SEM, almost eliminate the chances for messy oil spills. 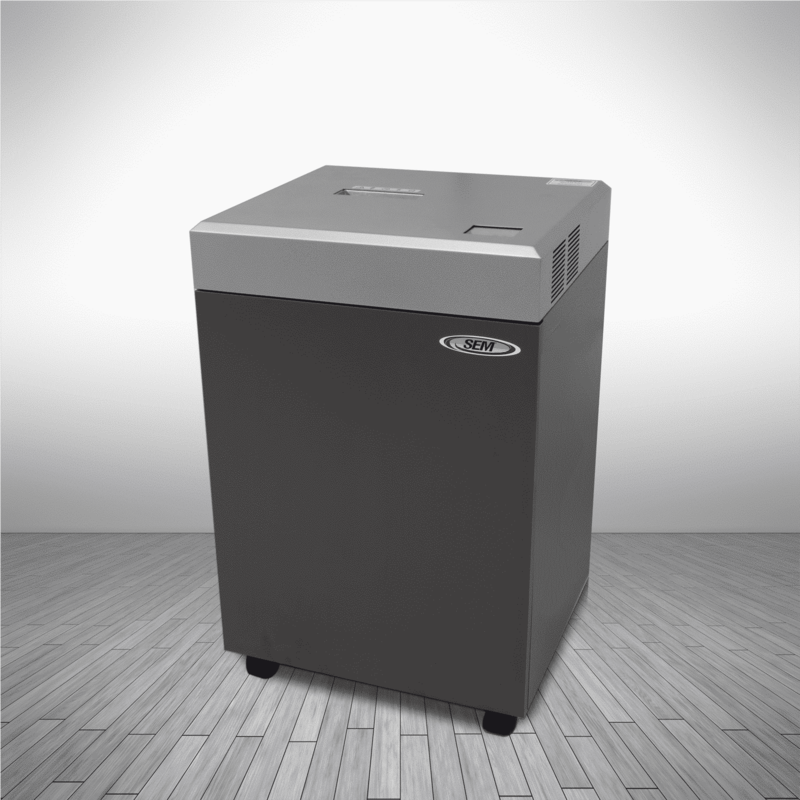 When considering a high quality, high performance paper shredder, the protection of the investment with an easy to install, easy to operate auto oiler is a highly desirable feature.